James Cox was introduced to medical marijuana following two operations for testicular cancer that had metastasized to his stomach. He found that it helped his pain, nausea, and eating disorders resulting from the cancer, chemotherapy and radiation therapy. During his illness he was prescribed the narcotic, Demerol, which, in combination with marijuana, helped him cope with chronic pain from the nerve damage to his stomach, other organs, and ulcers. Marijuana also helped his inability to tolerate food and loss of appetite. James was on Demerol for fifteen years and became addicted. He found that if he increased his marijuana intake he could get off the debilitating Demerol and gain control of his life. Since James could not afford to buy his marijuana medicine on the black market, he began to grow his own. Police discovered his garden while investigating an attempted burglary to his home. James and his wife, Pat, were arrested and the home they had just inherited from her mother was confiscated. James was sentenced to fifteen years behind bars, and Pat to five. Devastated and depressed, they attempted suicide while out on bond, but were discovered and saved. His sentence was given a stay and they were sent home. A free man, James' desire to live returned, and he went back to growing his medicine. His health improved, but two years later, James was arrested once again on cultivation charges. This time they locked him away. Lacking adequate medical attention in prison, he was near death. It took two stomach surgeries during his incarceration to keep him alive. "Since I have been incarcerated and deprived of its use I have lived in constant discomfort which I feel is a direct result of not having the medical benefits of marijuana. My stomach deteriorated to the point to where I could not eat anything due to incurable bleeding ulcers," James wrote in 1995. After spending almost five years in prison, James has finally gone home, but his government-enforced suffering is not over yet. James pain is intolerable and doctors concur with this. However, he will be on parole for the next ten years and will be drug tested twice a week for marijuana for the next three years. Doctors can, however, prescribe morphine for him. As a result, he has tested positive for opiate-type drugs. The state of Missouri is now threatening to send this patient back to prison for medicating his pain to bring it to a tolerable threshold. 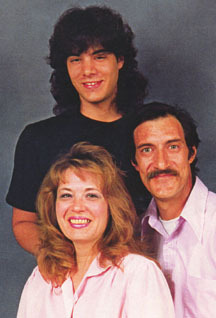 Right photo: James with his family in better times. Left photo: James suffered from severe weight loss following his incarceration and prior to the surgeries.